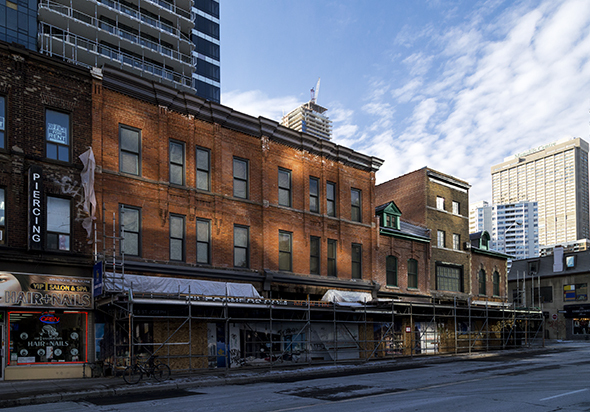 After three years of painstaking heritage restoration, the scaffolding has finally come down on a row of century-old storefronts on Yonge St. 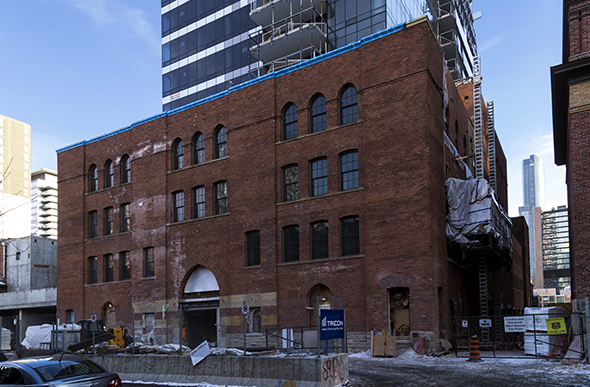 The FIVE Condos at the corner of Yonge and St. Joseph have been under construction since the summer of 2011. The podium of the 48-storey residential high rise is made up almost entirely of existing structures, several of them more than a hundred years old. 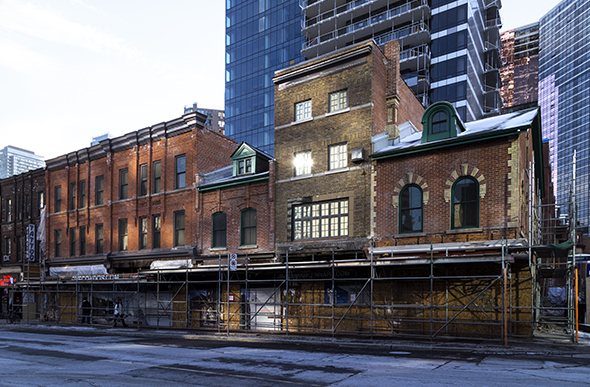 The main entrance, on St. Joseph St., is the painstakingly retained and restored facade of Rawlinson Cartage, one of the oldest moving companies in Toronto. In order to lay the foundation for the residential tower, the three-metre thick wall was suspended on a massive cantilevered steel truss over the excavation pit for more than year. "That was a bit of a tour de force. I don't think anyone in Toronto had done that kind of work before, that extensively," says Michael McClelland, a principal with E.R.A. Architects, the firm responsible for the heritage elements of the project. "We did get a lot of comments from people about how huge the truss structure was ... but it was really necessary. That was such a fantastic building with very, very fine brickwork so we wanted to make sure [the support structure] worked." On Yonge St., the storefronts have been renovated and the upper floors turned into residential units. McLelland says the brick exteriors have been extensively cleaned up, too: thick layers of paint carefully removed from fragile brick and mortar. "Some of the buildings were painted very heavily, so there was a lot of deterioration of the brick, actually much more than we'd originally anticipated," he says. "The corner building dates from the 1860s so it hadn't really received much attention for a long period of time. That's why the scaffolding was up for such a long period--the work was fairly labour intensive. We're really pleased with how it's turned out." The FIVE Condo is due to open later this year. 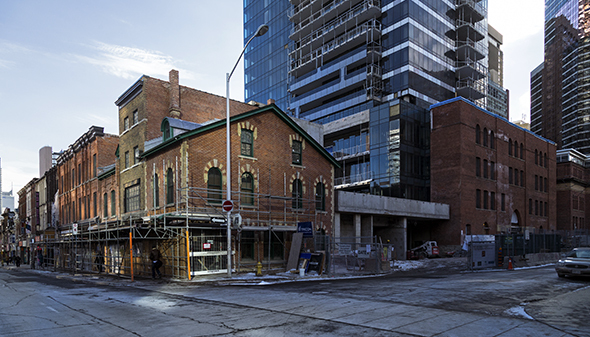 McLelland hopes the project will inspire other similar heritage restorations on Yonge. "That section of Yonge St. is a bit run down, but it could be fantastic, so we're hoping this is a kickstart to getting other fantastic things happening."